Considered among the most productive ecosystems on the planet, wetlands account for 4.7% of India’s total geographical area. Wetlands are defined as submerged or water saturated lands, which may be natural or artificial, inland or situated in a coastal area, permanent or temporary, having static or flowing water, vegetated or non-vegetated, which necessarily have a land-water interface. According to the Space Application Centre, Ahmedabad, 2,01,503 wetlands are spread across the entire nation with Gujarat recording the highest proportion. These wetlands are generally classified into lacusterine, marine, estuarine, riverine and palustrine. Agricultural benefits: From acting as a source of irrigation to recharging ground water levels, wetlands provide multi-purpose services. They also play a crucial role in boosting fish production from inland water bodies in the country. Carbon sequestration: It is a natural or man-made process by which gaseous carbon dioxide present in the atmosphere is stored in solid or liquid form. The wetland sediments form a long-term storage option for carbon whereas biomass forms a short-term. Flood control: Wetlands trap nutrients and solids suspended in streams flowing into rivers. Additionally, they minimize flood damage by slowing down the flow of water, thus lowering its impact. Apart from these, wetlands also hold immense cultural significance in our lives. Holy places like Pushkar Lake in Rajasthan etc. are worshiped by devotees from around the world, serving as a reminder of the fact that our sustenance is heavily dependent on nature. Delhi, India’s National Capital is a wetland-rich city. They play several significant functions and are of utmost importance to the city. Most importantly, wetlands help in pollution abatement. The contaminated particles present in the environment are collected in these wetlands that act as a basin and thus help in maintaining cleanliness. Their importance increases manifolds in Delhi, a city battling huge amounts of pollutants. Wetlands also perform the role of biodiversity hotspots in Delhi. Their nutrient-rich environment with ideal conditions for carrying out photosynthesis provides a perfect habitat to a wide variety of species. It is because of these water bodies that Delhi continues to be a home to a plethora of species of flora and fauna, and a breeding ground for several migratory birds. Furthermore, the presence of these wetlands and a rich biodiversity attracts tourists and avid birders alike. For example, the Hauz Khas Lake can be seen flooded with visitors at any time of the day. This has given a strong boost to tourism in the capital. There are approximately 611 water bodies in Delhi today, some prominent ones being Sanjay Lake, Shamaspur Khalsa, Bhalswa Lake, Hauz Khas Lake, Surajpur wetlands etc. However these natural ecosystems are now witness to the clashes between environmentalists and environmentally-aware citizens on one side and civic authorities an encroachment by citizens on the other. Negligence towards urban ecosystems in the context of Delhi also has a negative impact on the status of these wetlands. According to a survey conducted by Delhi Parks and Gardens Society, 274 water bodies have dried up, with 190 incapable of a revival. Eutrophication or excessive growth of plants due to richness of nutrients also plagues the survival of wetlands. The Bhalswa Lake has been adversely affected by high proportions of nutrients due to disposal of horse/ cow dung in the lake. The deposition of waste-water sludge causing siltation leads to blooming of plants like water hyacinth, especially during summers. The Hauz Khas Lake in South Delhi is dying slowly due to untreated sewage water. Urbanisation too, poses a huge threat to the sustenance of water bodies in Delhi. Acquisition of vast areas along the banks, illegal encroachments, lack of legal proceedings – all account for the worsening condition of these wetlands. Lack of public awareness and initiatives to revive the wetland ecosystem is an area of concern. Most citizens are neither motivated for conservation nor informed about the depleting resources by public authorities. 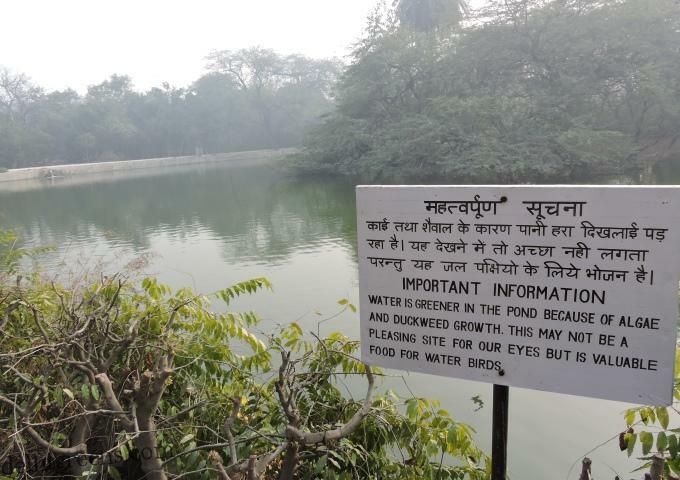 Recently, with an aim to revert the pathetic condition of Delhi’s Hauz Khas Lake, the Delhi Development Authority (DDA) decided to introduce floating wetlands that will treat the water for sewage naturally. The purification process involves completely natural processes such as microbe treatment, filtration etc. In similar attempts, villages across the capital are being equipped with an efficient sewage treatment system. Rain water harvesting and regulation of underground water withdrawal are also being implemented as per Hon’ble Court orders. Moreover, in order to prevent overflow and leakage, old pipes are being repaired and replaced. However, a lot more still needs to be done. Elaboration of wetlands conservation in Master Plan of Delhi or Funding programs are an urgent requirement for protecting these critical environmental resource. Landscaping and greening of existing wetlands can enhance their visual appeal and lead to development of public interest towards them. Most importantly, one needs to realize that urbanisation and wetlands can coexist, provided we understand and begin appreciating the services provided by these wetlands. In India lots of people using groundwater method for waste water for reuse. At the present time Groundwater recharge and rainwater harvesting turn into extremely popular in India. Groundwater Recharge arrive in different-different techniques for trouble-free catchment structure under a downspout to massive alternative cisterns or water tanks with all-around filtration systems that can store thousands of gallons of water.